We have taken all that we have learned from recent years and teamed up with a top manufacturer, highly endorsed by international airbrush artist Chuck Bauman, to create our own brand and extensive range of airbrushes. 1.8m Air Hose (1/8BSP Female Fittings), Quick Disconnect Coupler, Mini In Line Air Filter, 1 x 0.3mm Needle / Nozzle / Nozzle Cap set & 1 x 0.8mm Needle / Nozzle / Nozzle Cap set. The BARTSHARP 186 Airbrush is a traditonal pen style with dual action and gravity feed . It comes fitted with a quality 0.5mm needle, nozzle and nozzle cap. This set up is for general purpose spraying and will allow you to create a hair line spray width up to approximately 28mm. However it can also be fitted with the, included, 0.3mm needle/nozzle set for creation of finer lines or detail. 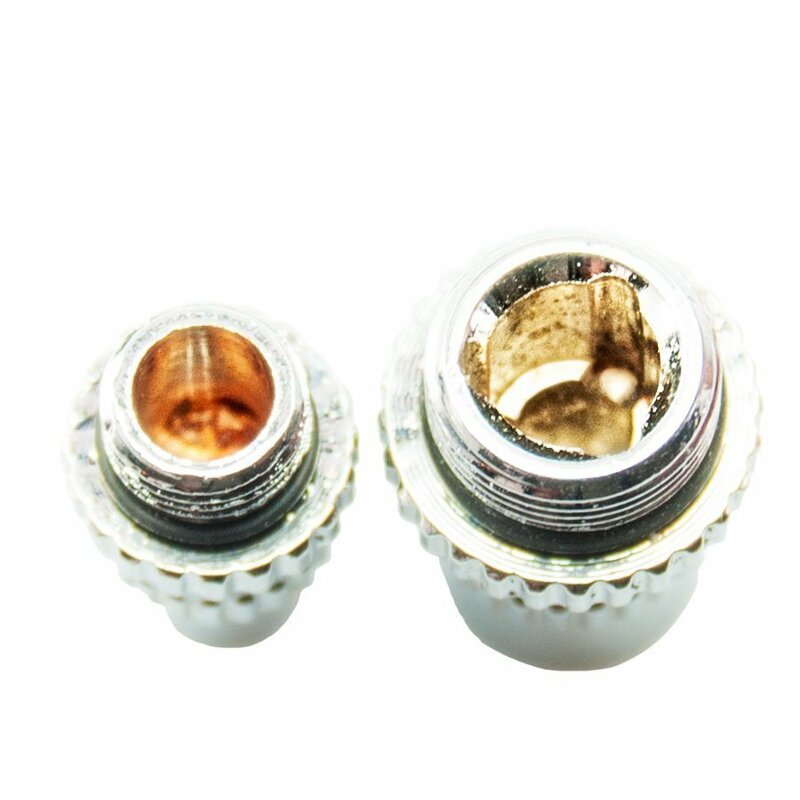 A 0.2mm needle/nozzle/nozzle cap set is also available for even greater detail (please see the airbrush spares section). Alternatively it can also be fitted with the, included, 0.8mm neelde/nozzle set which is ideally suited to those wishing to spray slightly thicker mediums, such as with cake decoration. This larger size set up optimises a smoother paint flow and will help to prevent clogging and splatter associated with the use of smaller needle and nozzle and makes them more suited for mediums used in cake decoration. Dual action: push down on the trigger for air and pull back, on the trigger, to release paint. The BARTSHARP Airbrush 186 incorporates a new nozzle and nozzle cap design which has been specifically developed to handle slightly thicker mediums. It also has a MAC (micro air control valve), fitted under the front part of the airbrush, which allows you to have fingertip control over the volume of air being delivered to the needle. The MAC valve gives you ultimate control over reduction of your air pressure and removes the need to adjust the settings at the pressure regulator. These new nozzles are a complete change from the standard design making nozzle change and airbrush cleaning a breeze as they simply push into the airbrush body cap and are held in place by screwing the nozzle cap down. The new design nozzles also have a Teflon bush which prevents paint from escaping from behind the nozzle and is also impervious to highly aggresive paints. The below image shows how the new design nozzle is much larger compared to a standard airbrush nozzle. The below image shows how the new design nozzle cap (right) which allows the nozzle to push fit into place and is much larger when compared to a standard airbrush nozzle cap (left). Your BARTSHARP Airbrush 186 is also fitted with a needle adjust screw on the rear handle. 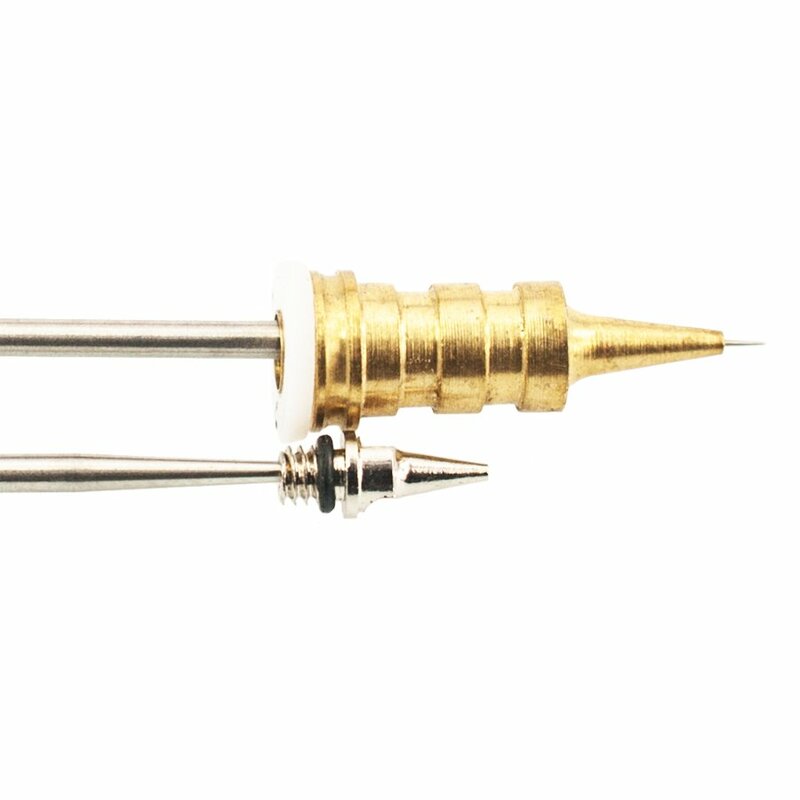 Adjusting this screw allows you control how far the needle is able to move back which, in turn, allows you to create the same thickness line over and over again. We have a limited number of these particular airbrushes. Cheers mate your persistent pushing made me take the plunge and now I'm loving it. Love using this 186. Love teaching with it too. The last 3 guys I've had in have been lucky enough to drive this awesome airbrush. We love it. Mark Andrews: SESKU & HEMSWORTH Scale Model Club. Just before Christmas I got hold of a Bartsharp 186 airbrush to try out. Reason being we get asked a lot about a decent budget range entry level airbrush on the forum. In the past I've always recommended Veda airbrushes but they became hard to find and I discovered the company had been taken over and manufacturing quality had dropped a lot. The new Bartsharp airbrush range has been designed by Bartsharp and Chuck Bauman, it features drop in style nozzles and 3 interchangeable paint cups - 2cc, 5cc & 13cc a lot like H&S airbrushes. They can also be fitted with 0.2mm, 0.3mm, 0.5mm or 0.8mm Needle / Nozzle set up's. "Can't say enough how good mine is. 186 should be all I ever need"